As an alternate to the normal distribution, the ERRORMODEL statement can be used in a simulation to specify other distributions. The distributions available for simulation are Cauchy, chi-squared, F, Poisson, t, and uniform. An empirical distribution can also be used if the residuals are specified by using the RESIDDATA= option in the SOLVE statement. Except for the t distribution, all of these alternate distributions are univariate but can be used together in a multivariate simulation. The ERRORMODEL statement applies to solved for equations only. That is, the normal form or general form equation referred to by the ERRORMODEL statement must be one of the equations you have selected in the SOLVE statement. In the following example, two Poisson distributed variables are used to simulate the calls that arrive at and leave a call center. 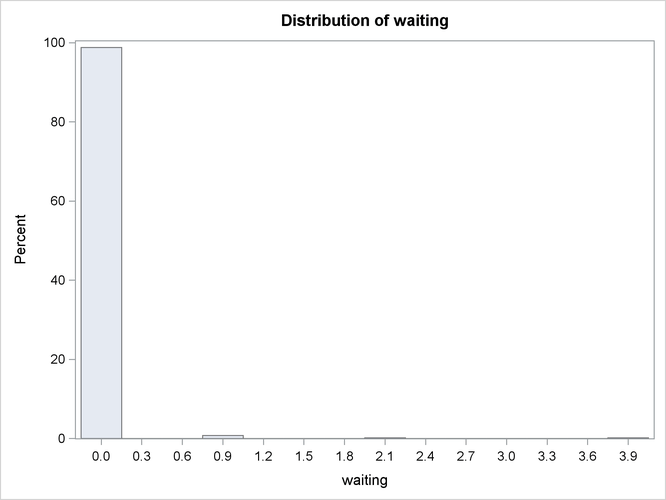 The distribution of number of waiting clients is shown in Figure 19.73.